View Poll Results: How many days of over 20c can you expect in April on average? How many days of over 20c (daytime high) can you expect in April on average in your location? In Brighton its really hard to tell because of the sea, but I would say something like 3 days? It often reaches 18-19c but 20 seems to be a bit harder to reach. Well what would you guess? One would be nice. We don't even hit 20C every April so I'll say I expect 0.5 days. None. It is almost unheard of. Normally we top out at 15-16°C for a usual April. 11.71 days is the average since 2000, ranging from 4 in 2002 to 21 in 2007. Not only 20c is reached everyday of the month, it essentially never go below it. Everyday of the month, bar one or two on colder than usual years. 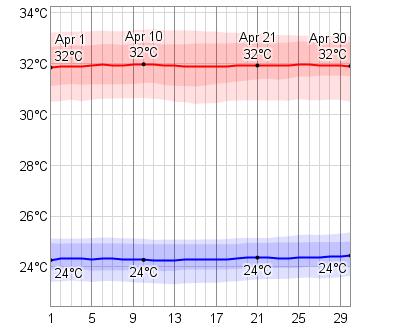 The average warmest day in April reaches 22C, usually between 2-4 days are over 20C. Everyday, unfortunately. These megathermal climates are despicable. I get 4 20°C+ days on average in April. Would prefer a few more.